We saw a picture of our GSD on a rescue site, when we arrived we were told that 1 of the dogs in her pen (but not from the same mother) had died of Parvo... we took the risk and adopted her any way. After being at home one day she became lethargic... had runny stools and began throwing up all the typical signs of Parvo. they were gone on the third day. for the next week she continued to improve and fall back so we took her to the vet. They told us the symptoms were not typical of parvo, they sent us home with antibiotics. After another week she was so weak she could not even stand and we took her to the vet for fluids. When we took her in they tested her stool and discovered she had Coccidia we were sent home with medicine that quickly made her better. The best part was it was a cheap medicine although the three days in the hospital were a bit costly. Soon after she recovered we realized she was losing her hair and had really dry flaky skin. We had her tested for Mange and had the vet look for flees they had no idea what the problem was until they called us back a few days later when my puppy was missing nearly 2/3 of her hair and said she most likely needed zink sulfate. We immediately went to the store and got the medicine, within two days we saw an improvement and now her hair is nearly back in full and it looks better than ever. She was 5 weeks old and 5 lbs when we adopted her and now she is 11 weeks old and 18.5 lbs. She knows Sit, Stay, Down, shake hands and is potty trained. She is great with our baby daughter and is a joy to be around. Mia is a great dog and we are glad to have her even with all her drama! Thank God you were there to save her. I'm sure you both have a special bond that can't be broken. Your little Mia is Beautiful and she is getting the Love she needs to get better and stronger and to have a wonderful life. I know how precious your little girl is cause I too, have a GSD puppy named Mia, she is my "heart" just like her big sister Ebony, who is in heaven. 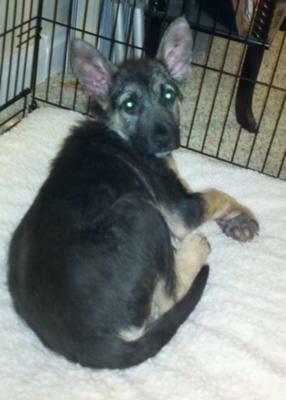 If you like read our story it is "heartwarming" go to http://www.german-shepherd-puppy-mias-story. Take care of each other!